The Abu 6500-C3 Classic reel has for over two decades been the baitcaster of choice for many thousands of New Zealand salmon anglers. It has been, and remains still, by far the biggest selling reel of its type in New Zealand. I personally own four of this model and have caught many salmon on them. The 6500 has undergone various upgrades over the years. There are also several model variants. The model that everyone would recognise is the black Ultra Cast 6500C. This reel has three ball bearings and a gear ratio of 4.7:1. The paddle handle has round black knobs. It holds 220 yards of 20lb monofilament fishing line. This being the ideal amount of line for a salmon reel used for river fishing where very long casting is not required. If you were going to be fishing the surf you would want a bigger reel with greater line capacity. To get the best out of your Abu 6500-C3 always ensure that you fill the spool to within 2mm of the top or casting distance will be greatly reduced. The precision quality solid brass gears should be kept lightly oiled. 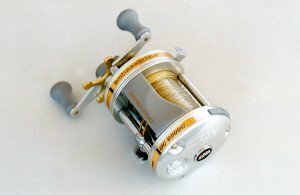 At least once a season, and preferably at the beginning of each season, the whole reel should be stripped, cleaned, lubricated, and reassembled. Then spooled with fresh line. After this treatment you will notice that casting is greatly improved. The reel will also sound different and be less prone to tangles. The 6500-C3 is the embodiment of precision Swedish engineering. The company was founded by Carl August Borgstrom in 1921. It originally manufactured pocket watches, telephone timers and taximeters. After World War II Abu redirected its efforts toward the development of precision fishing reels. The first reel, named Record, was marketed in 1939. The generation of world famous Ambassadeur reels got their start at the 1954 New York World’s Fair. The Swedish-built ABU 444, the company’s first spinning reel, was introduced in 1955 followed in 1965 by the first Cardinal reel. These events are still remembered as some of the most significant in the history of the sportfishing tackle industry. Perhaps one of the main reasons the Abu 6500 has stood the test of time is the availability of spare parts. 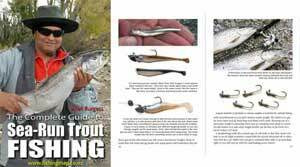 Salmon fishing is tough on gear; reels especially so. The constant casting and winding of the handle will quickly expose any weakness in design or construction. Here the 6500 has proven itself a winner on South Island riverbeds were nor-west winds often whip up dust storms during summer. Some of the best salmon ever landed in New Zealand have been taken on the Abu 6500. The pawls and worm gears for this reel are readily available at most quality tackle stores in the South Island. Whereas spare parts for other brands would not be available in-store and would need to be ordered! The later model Abu Ambassadeur UC6500C baitcasting reel. As anglers upgrade and buy new salmon baitcasters their old Abu reels are kept as spares. They may be battered and the paint worn off but because spares parts are inexpensive and readily acquired they can be kept working like new. Try to avoid laying your rod and reel down on the stones. This will avoid your valuable reels becoming scratched. The Abu 6500 is also inexpensive when compared with similar sized baitcasters from other manufacturers. Perhaps this factor also adds to its unswerving popularity. Currently a new 6500 in New Zealand will cost you around $230.00. There are numerous other brands of this sized baitcaster in stores in New Zealand for twice this price. Given the 6500s pedigree it is truly tremendous value for money. 6500-CT (black and silver) Original. (No level wind) features: Gear ratio of 4.7:1. The paddle handle has round black knobs. It holds 220 yards of 20lb monofilament fishing line. This was the original model released some 25 years ago. It didn’t have a level wind mechanism. The ends of the reel are flat as opposed to bulbous like the later models. Otherwise the 6500-CT is essentially the same. Weight 270 gm. 6500-C3 Rapid (black and red) features: Gear ratio of 5.5:1. The paddle handle has round black knobs. It holds 220 yards of 20lb monofilament fishing. Three stainless ball bearings. Weight 298 gm. Ultra Cast UC 6500 C (silver and gold) features: New exclusive Anti – Distortion Spool (ADS) Technology. Four Stainless Steel Bearings Instant Anti Reverse. Flip-Up Ergonomic Thumb-rest. Smooth Powerful Multi Disc Star Drag. Dual Cast Control Synchronized Level-wind System. Line Out Alarm. Specifications: Gear Ratio: 5.1:1 Line Capacity lb.test/yards: 14/250, 20/155. Weight: 320 gm. Line retrieved per handle turn: (23 inches – 58cm). The 6501 which was the same as the 6500-C3 but a left-hand model. The 6500-CLE a special 70 th Anniversary model with level-wind. The current 6500-C3 model is coloured silver and grey. It has the modern flat knobs on the paddle handle. The gear ratio is slightly faster at 5.3:1. and it has 2 ball bearings and one roller bearing. The level-wind now has a tough titanium nitride plated line guide which resists nicks and scratches and prevents line abrasion.